I've never been a big vegetable eater, especially the healthier ones that everyone says we need to eat a lot of, like dark leafy greens. I tend to cycle between peas, corn, and mixed vegetables, with maybe a carrot or potato thrown in every now and then to break things up a bit. But I've been trying really hard lately to add some variety to our diet, both to be healthier, and also for the sake of our poor taste buds. I made something absolutely, completely new for me last night that was so very quick and easy, and so surprisingly delicious (approved by the whole family) that I had to share with everyone immediately. The last time I ate brussels sprouts was when I was a kid, and I did not like them. Not at all. They came out of a box and were cooked in boiling water, tasted kind of like cabbage, which I didn't like, either. 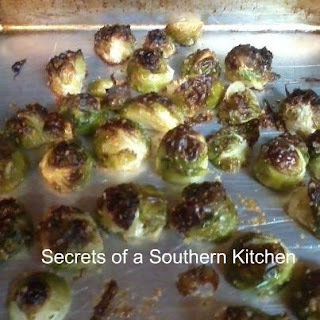 These brussels sprouts should be in a whole different category by themselves, though. Heat your oven to 375-400. Cut off the stem ends of the brussels sprouts, and remove any yellowed or discolored outer leaves. Cut small sprouts in half lengthwise, larger ones in thirds or quarters, to make the pieces fairly uniform. Put in a bowl, add olive oil and sprinkle liberally with Kosher salt (it's coarser and adds something to the texture) and garlic powder, and toss until well coated. Put on a baking sheet (with sides in case the oil runs) cut sides down and bake in in a hot oven for 30-45 minutes, or until the tops start to get from golden brown to the color of chocolate. I had my oven at 400, then turned it down to about 350-375 after 25 minutes or so. 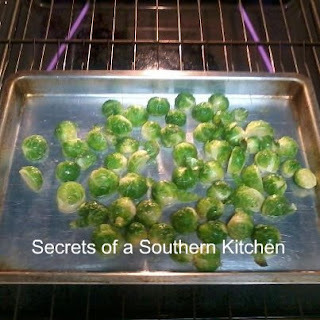 Your time will vary according to the size of the sprouts and temperature of your oven. Watch closely toward the end so they don't burn, but you want the yummy carmelization of the dark chocolate brown parts. There were some loose leaves that were browned to crisp that I ate right off the baking tray as soon and they came out of the oven, along with a couple of the larger pieces. We had dinner fairly quickly after these were done, and they were still delicious, but I have to say, next time I'll try to time these so that we're ready to eat immediately. The whole family gave these the thumbs up, so I'll definitely be adding these to our vegetable repertoire. What new things have you been cooking up lately? Until next time, good cooking, and good eating! LOVE roasted brussels - and I agree that they are far superior this way. I also really didn't care for brussels growing up. So many veggies in my childhood were cooked to death and NOT very appealing. So good to gather these tricks.